The History Of The Modern Barn Homes - Plum Builders Inc. 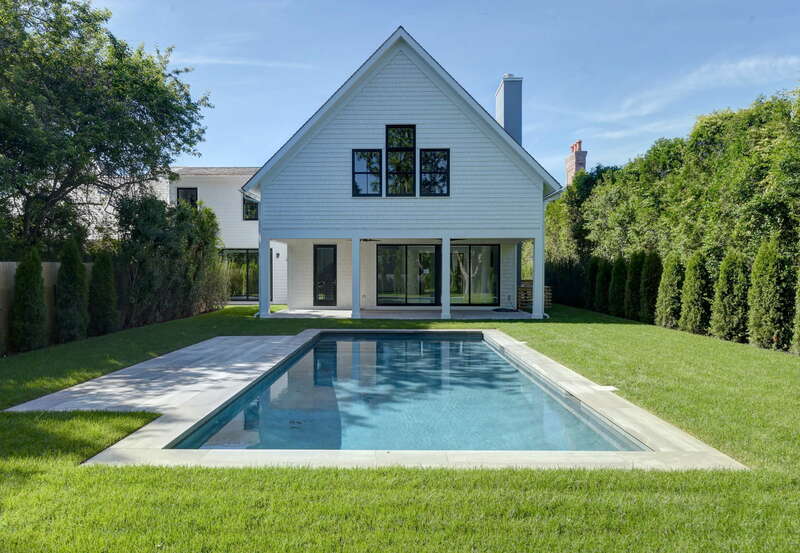 Learn About The History Of Modern Barn Homes Of East Hampton and Beyond. Barns have been part of East Hampton Landscape for hundreds of years. The earliest purposes were primarily utilitarian and used to store hay, grain, and wagons. The Mulford Farm barn, built in 1725, is the oldest in East Hampton. The Modern Barn homes of today are reminiscent of the grand barn structures special to the East End, and also reflect the experiences of Plum Builders Inc. founders Al and Mary Giaquinto. The result is a unique, trademarked custom home design that is remarkable in its simplicity and natural beauty. The earliest concept of The Modern Barn began with a specific room. 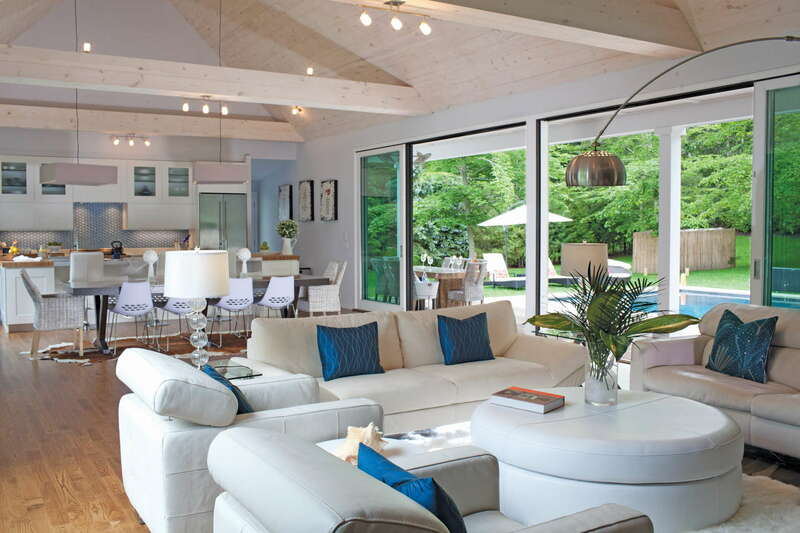 In 2006, Al Giaquinto worked on an East Hampton custom home design project with architect David Sherwood. While the home was a traditional design, the great room was known as The Modern Barn® room because of its openness and layout. Walls that typically separate living, dining and kitchen spaces were removed to create one, large, communal space. This was where The Modern Barn custom design began. The great room at Jericho was really the first time that we tried to incorporate all three living functions (kitchen, dining, and living) into one large space, and it became the centerpiece of The Modern Barn, said Sherwood. In hindsight, The Modern Barn’s origin and inspiration go back earlier than that first incarnation. In some ways, the open, spacious design is in direct contrast to the closed, boxy layout of the architecture that Al and Mary Giaquinto remember from the 60s, 70s, and 80s. The homes in the New York neighborhoods of Queens and Brooklyn were typically separated into several small spaces. Large homes were quartered; creating multi-family dwellings. But they were small and had limited space to grow and come together. It was Mary Giaquinto who recognized the limitations to freedom and creativity that all of those walls imposed on families. She believes that the physical walls affect people’s perceptions of what’s possible, and that space has a profound impact on people. Thus the need for openness and space in today’s family homes. The shapes of the rooms we live in growing up definitely shape our vision of the world. The Giaquintos took certain designs aspects of those original homes and wove them into the concept for The Modern Barn®. For example, homes in the Fort Greene neighborhood where Al Giaquinto attended high school at Brooklyn Tech had large windows in the front that let in swathes of natural light. This was one of the many design experiences that helped shape The Modern Barn. New York architecture – both city dwellings and the rustic barns of the East End – certainly influenced The Modern Barn, but the inspiration is not entirely local. Al Giaquinto also took inspiration from homes in the Caribbean and South Pacific, where homes are open to the outdoors. The Barn room in The Modern Barn reflects on the Great Hall of the Medieval Times, and other large, communal gathering spaces within homes through history – albeit with a much more contemporary look and feel. The Modern Barn of today was born of the inspiration and the experiences of Al and Mary Giaquinto as well as the design/build process of the first Modern Barn. The Modern Barn room at the house on Jericho was incredibly successful and popular. It was desirable to such a degree that the Giaquintos knew they were onto something with the concept of the large open spaces in a rustic barn setting. 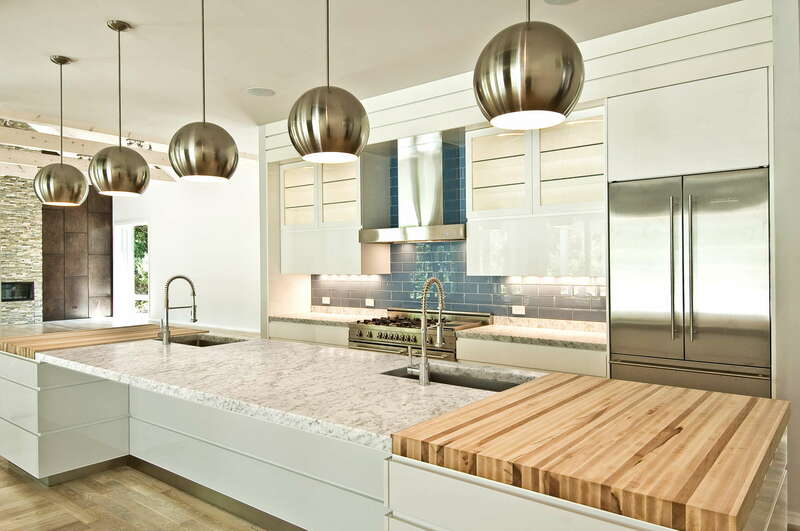 They built several homes in The Hamptons based on this design, working with architect Alexander Gorlin. The house was the right combination of traditional and modern materials and contemporary and rustic design. They embraced the fact that in The Hamptons, people were desiring to go back to a traditional barn structure. The first home sold very quickly and the rest followed suit. The Modern Barn homes were built around common design elements: gorgeous, expansive kitchens, awe-inspiring entries, exposed beams, and remarkable, large barn doors. On the outside, the homes are a mixture of modern and traditional and reminiscent of historic architecture. On the inside, modern amenities and high-end luxury meet the needs of families looking for idyllic second homes and family destinations. The Modern Barn homes are designed for families. The big, communal spaces inspire people to think up ways to bring their extended families closer – something that is common in The Hamptons. “When people walk into the barn room, they smile unconsciously, and they say ‘Wow, imagine what we can do in here. We can have everybody here for the holidays,'” said Al Giaquinto. In The Modern Barn homes, the walls of separation that tend to section off families and make homes feel closed and small are removed. As a result, natural light, space, and scale blend together to create environments that are open, peaceful, and inviting. The Modern Barns meet the need to have large, open, communal spaces that bring families and friends together in natural settings. The homes are designed in such a way as to foster and nurture communication and togetherness. Each space in the home is intentionally and carefully designed to be functional, while at the same time, luxurious and contemporary. Both interior and exterior spaces cater to the needs of the individual and family. Kitchens, dining rooms, and living rooms come together as one in The Modern Barns. That open, boundary-less design in the communal spaces is what draws families to these homes. You can view featured homes our portfolio. Modern architecture is embracing the rustic barn structure and style again. Trends are moving in the direction of a modern farmhouse, and it continues to gain popularity year after year. Light and space are desirable features – which is why lofts became so popular over time in lower Manhattan. When they can, people will choose to have a large, open space with lots of natural light and few interior walls. Walls and boxy homes tend to instill a perception that there are limitations in life. On an individual level, removing the walls gives people a sense of freedom. For the family, the open space inspires images of future family gatherings and an opportunity to connect. The Modern Barns balance the need for personal space by creating intimate, thoughtful bedroom suites. And throughout all of the homes, high-end appliances, features, and modern amenities abound. The result is a luxury, custom designed home that meets the needs and wants of every member of the family.